Moschino will launch Gold Fresh Couture, a new flanker to 2015's Fresh Couture. Gold Fresh Couture follows Pink Fresh Couture, which debuted earlier this year. Notes for the woody fruity floral include mandarin, grapfruit, pear ice, rhubarb, jasmine, mahonial (Givaudan molecule; lily of the valley), orchid, sandalwood, akigala wood (Givaudan; patchouli fraction), vanilla and musk. 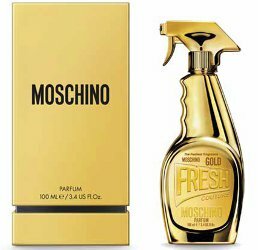 Moschino Gold Fresh Couture will be available in 100 ml Parfum, and possibly other sizes as well. Look for it next month. Why not go with different cleaning product bottle shapes, to shake things up? A dish soap bottle, a Comet can, etc etc??? Since it’s gold and oh-so-appropriately woody, may I suggest a Pledge spray? Then I hope you shall have it!